Welding machines are essential for different types of work, including construction, engineering, mechanics, woodwork and a wide array of other applications. However, they are also more complicated and sometimes more fragile than different types of tools, which generally leads to several problems that could cause them not to function correctly, waste your time, money and effort. To avoid that, here we are gonna go over almost every one of these problems and at the same time help you fix them and prevent them. Come and take a look further into this article to find out more! 3 Start Taking Care of your Welding Machine Now! A welding machine may sometimes don’t start, and it could be either a straightforward problem like it has an overload or has a mistaken voltage input, or it could be a terrible problem, such as a shorted circuit, a blown-up power supply, or even worse. The first and foremost thing to do here is to check if the switch of the machine is turned on. Then, if it is, check that it is connected directly to an input that fits its electric needs. If these are all okay, wait for a few minutes before turning it on again, at least 30 to check if it is overloading. If it doesn’t work, then it is something worse. Now, it is time to check the circuit table, if it is shorted, time to change. If the power supply if blown up, you must replace it as well to avoid future problems. And if nothing of this works, maybe is the power cord or something electronic more than electric or physical. Call an expert in this case. It is a common thing to experience when the machine begins correctly, and you’re almost there to begin wielding, but the fuse blows. Here, you undoubtedly have an electrical problem, and it could be both because the fuse is too small for the machine, or you have a shorted circuit. To check if it is the fuse, change it and see if the problem persists. If it does, it is time to make sure that the machine is not shorted inside. Check everything, from the cables to the insulation up to the circuit table, make sure everything is okay – which probably won’t be. If it is all okay, you may need to get a new power supply, as it is blowing your fuses. Sometimes it happens that you are welding and the machine suddenly stops without apparent reason. Here, it can be lousy ventilation, overloading or a defective cooling fan not doing its job. To check, make sure that the device has every fan and ventilation holes cleaned up and working when it is turned on. Change the fans or clean the equipment if you need to. If everything seems okay, then check to see that it is not overload, waiting at least 30 minutes after turning it on again and using it. If the problem persists, very likely it is a shorting problem – so you must check the circuits and cables inside, and you will surely find the reason. The polarity switch is essential for specific welding applications, and some use it for almost everything. When it doesn’t work, it can be a real headache. And it could be either because a cable is worn out or because it is being used while wielding. To fix it, check that cables are all correct and in great state, otherwise just replace them. Also, remember never to use the switch when the welder is under load, it is a critical rule for using these devices. Whether it is because the holder is loose or because the duty cycle is not the right one, it can be a problem that makes welding almost impossible. Just make sure the holder is tightened correctly on the device. If it is not, just tighten it up correctly. Else, change the holder for the right one, as it may be already broken. Electric shocks are most common when touching the welder directly. It is not a regular problem, but it can happen and be dangerous. Mainly occurs when the device is not grounded appropriately. The best way to fix electric shocks is to check the manual of the product and learn how to ground it depending on its size & controls. If not, try rooting it by yourself if you know how, or talk with an expert. Then check that it is not doing shocks anymore. Some welding cables tend to get hot while using them, but it should never be something that makes it melt or untouchable. When this happens, there’s no other reason than an improper cable size for the device. It means you need to change the welding cable for the appropriate size, usually the size that says in the manual or naturally thicker than the present one. When the machine doesn’t want to switch off, it means the power cord is not working correctly, or the switch has burned out. And of course, it could damage the device, or even worse, harm you while using it. To fix it, you will have to check the switch next time you connect it, making sure it is switched off and then switch it on to see if it works. If it turns off and on without problems this time, it means you will have to change the power cord or internal connections. Sometimes it happens that the device is welding deficiently, with a low welder spark that doesn’t work for your needs. Here, the most likely reason is the tip that touches the fuse or fuse is worn out. The only way to fix this is changing the tip inside the gun, usually, a bronze part that will look worn out and could cause even more problems. As soon as you experience low welding spark, change this part before it is too late. When you are welding something and feel like the surface of the soldered metal is too porous, it means you may have wiring problems or inappropriate gas flow in the machine. Make sure the power cord and internal connections are all working correctly and with no physical signs of problems. Then, if the device is gas-powered, make sure the gas source is delivering constant & even fuel. If this is not happening, very likely it is a plugged valve or tube, check accordingly and repair. If you see a weld with cracks, it means the welding is not working correctly. Again, this means that the device may have an electrical problem, or else you are using a worn out fuse or solder. Make certain that you are using the right fuse and solder for your needs, and the whole device has no electrical problems. Check everything from the power cord to internal connections. When the device is welding, and the solder creates too many sparks when touching metal, it means that it is overloading or that you’re using too much impedance. For both of these problems, simply check that voltage is the proper one for the device. Also, check that every control is at the right level to reduce impedance problems. This will surely help. Now that you’ve taken a look at the most common problems you can experience with a welding machine, it is time to see how you can prevent all of those problems before they even happen. Follow these tips and never suffer them! Always follow the device’s specifications to avoid misusing it. A welding machine is more complicated & fragile than most people think. Duty cycles are always recommended to avoid overloading or overusing the device. Never push the welding machine to do something that it is not fitted to do. Use small devices for small projects and large ones for large ones. Clean up your devices at least once a month to make sure no debris or dust stays inside. They could damage your welding machine without you even knowing. Cover all your welding devices correctly, make sure no particle of any type can enter inside them. Never do woodworking or similar activities near machines such as a welding one. If you can, bring the device to another place before starting any action that leaves dust, debris or other particles in the air (including sparks and water). Grease up your welding machine sporadically, oil up what needs to oil up, and do maintenance according to the machine needs. Plan a monthly or bimonthly maintenance process for your welding machine. Turn it on, clean it, grease and oil up, do whatever it needs to keep working correctly. Depending on how you use it, you may need to do maintenance even every two weeks. Replace the parts that are harder to fix. Some parts can’t be repaired, such as circuits, power cords, and other internal cables. It is always satisfying to replace them with new ones and avoid further problems. Always choose the right fuses and solders to use with the device. The wrong size or type may eventually harm your welding machine. Take the right precautions. Even though you want to take care of your machine if you don’t follow the proper precautions you may end up harming yourself. Start Taking Care of your Welding Machine Now! 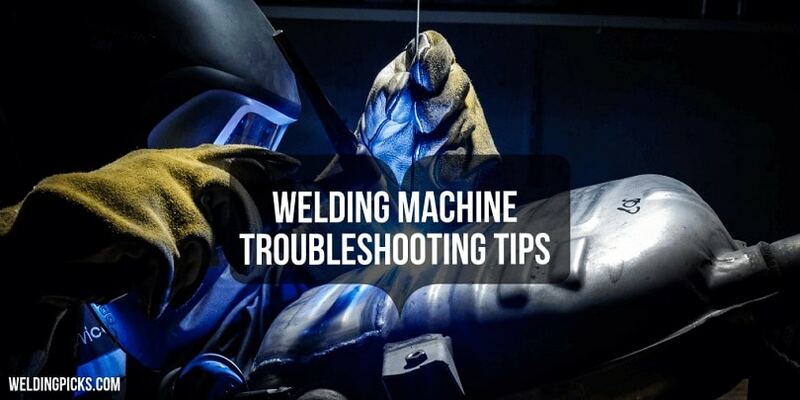 There’s almost no hard thing to do when it comes to taking care & troubleshooting your welding machine when needed. It is more complicated than others tools, yet it is a total piece of cake when compared with the hardest of instruments. So start doing that critical maintenance to your device, it may be already malfunctioning, and one of these tips may be the solution for it! Try these recommendations today and forget about lousy welding machines!